For example, in March of 2017, Janet Yellen commented the “Phillips Curve is Alive“. On August 29, 2017 I noted that a Fed Study Shows Phillips Curve Is Useless. Yet, economists keep trying. The idea behind the new study was that we may not see wage growth inflation because we are looking in the wrong places. Notice how economists still cling to the notion that something may be different now. In reality, the Phillips Curve isn’t dead, it was never alive to begin with. 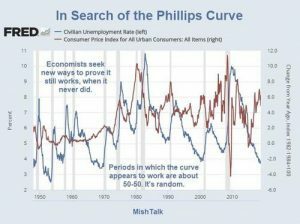 The Phillips Curve isn’t dead, it was never alive to begin with. None of the models the Fed relies on works. Repetitive bubbles are proof enough.